Lookout is a mobile app that provides free security features for your handset. Those who need an additional layer of protection can purchase the premium upgrade. 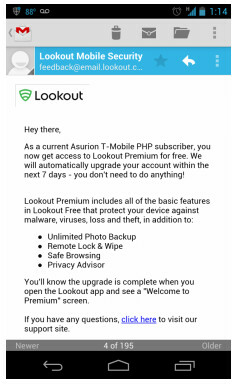 Certain T-Mobile customers are going to receive an email shortly, explaining that they are being given the Lookout service, including the premium upgrade, for free. Those with service from the nation's fourth largest carrier who also subscribe to Asurion Premium Handset Protection (PHP) or sign up for the JUMP! 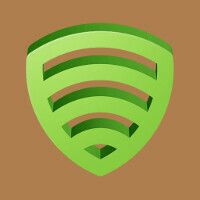 upgrade program will be rewarded with the free security protection from Lookout. The free service from Lookout includes all of the service that comes with the app, such as the ability to find your device on a map and make it sound an alarm, even when you have the volume set on silent. There is also anti-virus protection and backup/restore capabilities. You can even arrange to have a picture snapped with the front-facing camera on the phone and emailed to you, of any person that tries to enter a password three times. The premium service that qualifying T-Mobile customers will receive includes unlimited back up of photos, the ability to lock a phone and wipe it clean of sensitive data remotely, safe browsing, and a personal privacy advisor. T-Mobile customers will know that they are enrolled in the Lookout premium service by opening the Lookout app and seeing a screen that says, "Welcome to Premium".